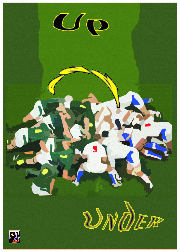 Up and Under, a board and card game on a Rugby Union match. It features both a non statistical game, and the stats for playing Six Nations 2007 and 2008 and TriNations 2007 and 2008. Andrew Kolb 8 8 8 I'm not really sure what to make of this game but it's playable and does what it says. roberto letizia 7 7 8 nice little game, if you love rugby.